Part of the Russian pharmacopoeia for treating a wide range of symptoms related to agitation. Used for easing the mind, releasing tension or preventing stressful episodes. Taken for short periods only. Phenibut is the common name for a psychotropic molecule, beta-phenyl-gamma-aminobutyric acid, which has a similar chemical structure to baclofen (Liorésal®), apart from one chlorine ion. It is primarily a derivative of the neurotransmitter gamma-aminobutyric acid (GABA), which plays an important role in preventing prolonged excitation of neurons in adults. That is why, like baclofen, it is able to bind to GABAB receptors and GABAA receptors, the type targeted by anxiolytics from the benzodiazepine family, as well as to dopamine receptors. Phenibut is particularly interesting, as unlike GABA obtained from the diet, it is able to cross the blood-brain barrier due to the presence of an extra methyl ring1. It thus offers exceptional bioavailability. What are the desired effects of phenibut supplementation? Phenibut is widely-prescribed by Russian doctors for easing tension, fear and sadness, helping to improve sleep in people suffering from neurosis, as well as for managing post-traumatic stress2 and stammering. It became popular as a result of the Russian space missions where it was used by cosmonauts for its tranquillising and nootropic properties (its ability to help maintain, boost or improve cognitive functions such as concentration and memorisation) 3. In Europe, however, phenibut is little-known since it is not produced and sold by the pharmaceutical industry, hence it is only available through nutritional supplement companies such as Super-Nutrition. Those who take phenibut do so for its ability to promote a state of euphoria, serenity or tranquillity, and to reduce levels of social anxiety. These are all effects produced by substances acting on GABAB receptors. These include GABA of course, but also gamma-hydroxybutyrate (GHB) and gamma-butyrolactone (GBL) 4, but the considerable side-effects of these substances make them unsuitable for use. Research has been carried out in Russia since the 1960s to evaluate its therapeutic potential, particularly its benefits for treating neuroses, depression, asthenia and anxiety. Its indisputable neural effects remain poorly-understood which is why it is still not being produced and sold in the West. Additional studies are required to confirm preliminary but highly-promising findings and to shed further light on the precise mechanisms and chain reactions triggered by phenibut. Who might benefit from taking phenibut? Well-being is a fundamental concern for all of us, though it’s also one which seems increasingly elusive due to the many sources of stress to which we’re subjected. These stressors put our bodies under severe strain and over the long-term, cause considerable damage to our physical health (respiratory, circulation and cardiovascular problems) as well as our mental health (depression, mood disorders, chronic stress, anxiety). It’s therefore important we act quickly to combat these stress factors and improve our ability to overcome them. To do so, we need to prioritise natural approaches with long-term effects, such as a healthy diet, good quality sleep, and yoga or tai chi-type exercise. However, there are always going to be exceptional stressful events which are too serious for such natural approaches. No-one can ignore the significance of these sorts of events for the future (the death of a loved one, serious errors or failures, crucially important exams, etc), and this is the raison d’être of molecules such as phenibut. Offering phenibut’s effects for boosting overall well-being, this bioavailable GABA derivative is available in dietary supplement form. 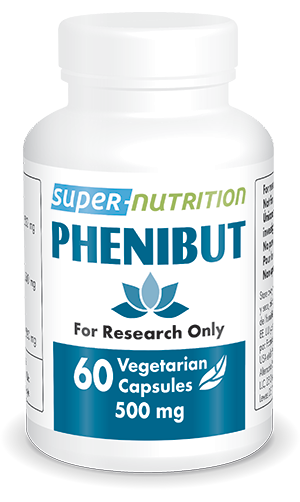 The Phenibut supplement sold by Super-Nutrition comes in vegetarian capsules and is optimally-dosed. Each capsule contains 500mg of beta-phenyl-gamma-aminobutyric acid, corresponding to a dose of two capsules a day. To prevent a dependency effect, it is advisable to take Phenibut supplements just for short periods – no more than one to two weeks, or to use it in exceptional cases only (before or after a particularly stressful event, for example). You may also be interested in other nutritional supplements that can help with the long-term control of stress such as Stress Relief Formula, or more occasional stress, natural extract of kava kava, or mood disorders, lithium orotate. Each vegetarian capsule contains 500 mg beta-phenyl-gamma-aminobutyric acid, a derivative of the neurotransmitter GABA, which has been used in Russia since the Sixties for its beneficial effect on anxiety.